Brussels warned Monday it might have to ban cod fishing in northern European waters next year after scientists issued a dire warning over dwindling numbers of the species. A moratorium affecting one of Britain's culinary staples, fish and chips, could soon be in place unless drastic action is taken to protect cod numbers, European agriculture commissioner Franz Fischler said. The commission's scientific and economic committee is examining an alarming report on cod stocks issued Friday by the independent International Council for the Exploration of the Sea (ICES), and will report back on 11 November. "Unless it says anything different, which is very unlikely, I can see no other solution in the short term than to propose for 2003 a zero (quota) for cod, haddock and whiting and substantial reductions for plaice and nephrops," Fischler said. Nephrops norvegicus is a small lobster common around the British and Irish coasts. 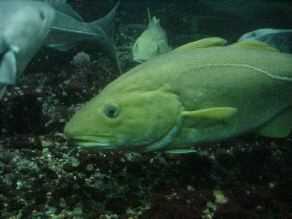 The ICES report recommended closing all fisheries catching cod "either as a target species or as bycatch" in waters including the North Sea, Irish Sea and channels west of Scotland. Fisheries around Norway, which is not a member of the EU, are also affected. "Needless to say that the economic impact of taking ICES advice literally would leave many coastal areas in deep trouble," Fischler said, pledging unspecified compensation to affected fishermen. "This is why I am duty-bound to think about whether there are any alternatives to taking this dramatic advice to the letter," he said, while sounding downbeat about any alternative being found. The ICES report had fully vindicated year-old commission warnings about fish stocks, Fischler said, complaining that Member States had failed to take any action. "I don't want to say 'I told you so'," he said. "But it is galling, after repeatedly warning of the dire consequences of inaction, to see our worst fears realised and to be now faced with recommendations for a moratorium on some cod fisheries. The independent findings justified root-and-branch reform of the EU's Common Fisheries Policy first put forward by the commission in May, Fischler argued. "Effective reform of the CFP to manage fisheries and fish stocks on a long-term basis is essential to rebuild cod and hake stocks and to stop overfishing destroying the other fisheries in the community," he said. The EU's executive arm wants to retire 8,600 vessels from the community fishing fleet from 2003 through 2006 at an estimated cost of 28,000 jobs. Sixty per cent of those boats would be French, Italian and Spanish. The commission also wants to replace the current system of annual quotas, which it argues prevents long-term planning to replenish fish stocks, with multi-annual targets for catches. Brussels wants further to strengthen monitoring of fishing, complaining that fraudulent reporting by quota-dodging fishermen and illegal landings are rampant. But a "Friends of Fishing" bloc -- France, Greece, Ireland, Italy, Portugal and Spain -- is fighting the proposed reforms. Fischler, however, has accused France of being the main stumbling block to progress. After a meeting of agriculture ministers late last month, the commissioner accused France of "hiding" behind the other pro-fishing bloc members.